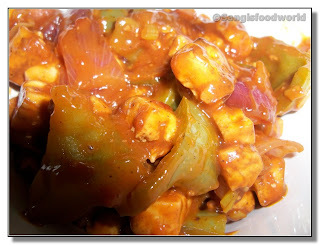 Here comes the recipe for the simple and yummy chilli tofu I made for our lunch yesterday with fried rice. Thinking what to do with the pack of tofu I was having my fridge, I landed up with this dish. 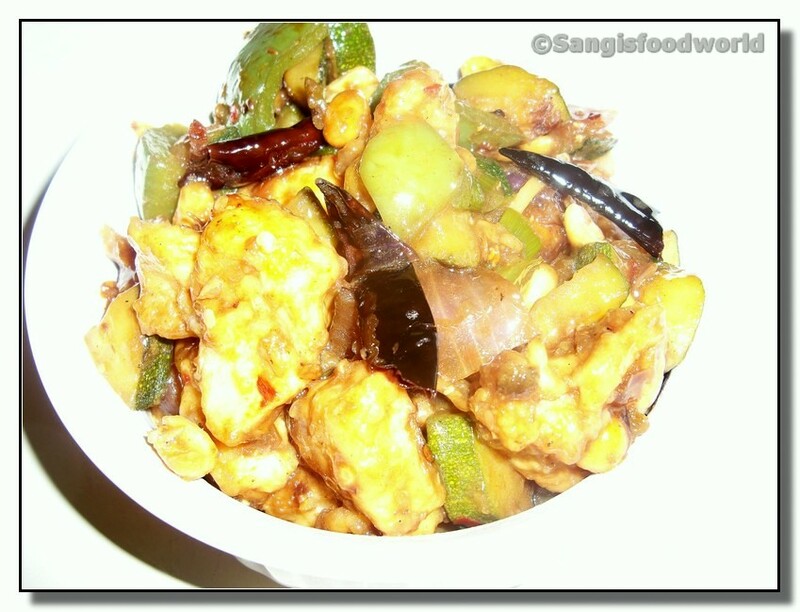 Tofu fried with few veggies like onions, bell peppers along with a touch of tomato ketchup results in a great side dish for noodles or fried rice. It goes well with chapathi also and can be fixed in less than 15 minutes. Extra firm or firm tofu will work great for this dish. 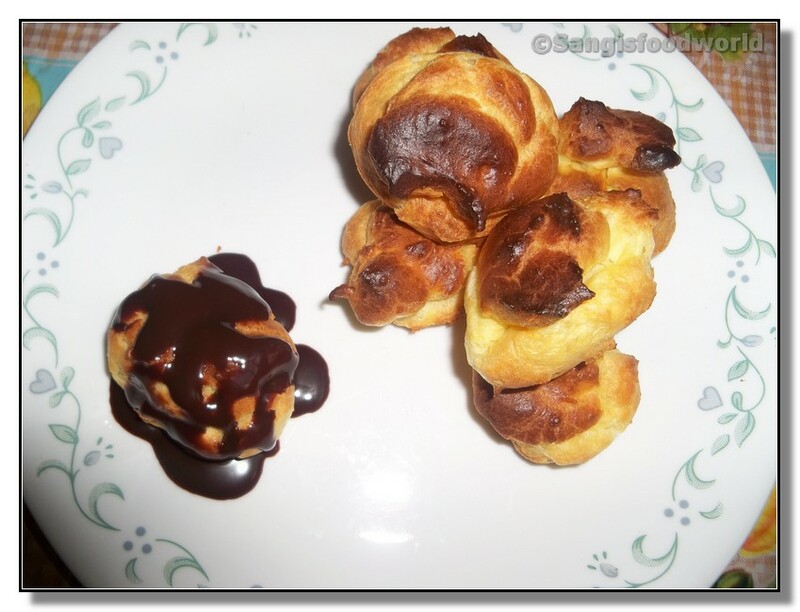 Profiteroles are French pastry shells that are quiet easy to make and can be served with many variations. In France they are often filled with whipped cream or ice cream or even served plain sprinkled with powdered sugar or a drizzle of chocolate sauce. These are popularly known as cream puffs in the US. The dough that's used for this dish forms the base for the other most famous dessert Eclairs. 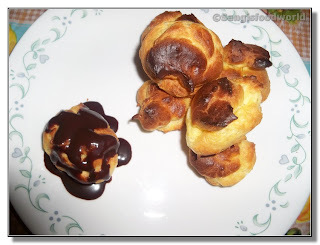 These yummy little puffs are made from Choux pastry (warm pastry). Profiteroles first appeared in France in the 16th century and are thought to have been created for Catherine De Medici's. 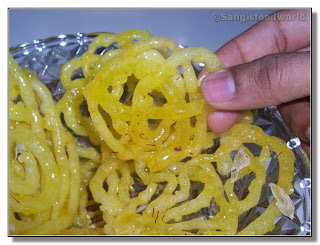 Here comes one my favorite sweets which I love to eat anytime and how much ever I want.. :D This is one of the few stuffs which me and my hubby love to enjoy together. It's his favorite sweet too.. Anytime he goes to the Indian sweets he will buy a few pieces for us to enjoy it. I was searching for a simple recipe to try at home. 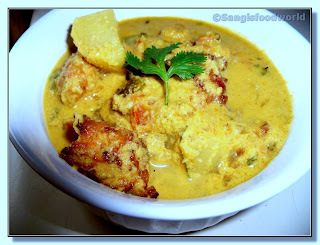 Then came the posting of Jelabi recipe in Show me the curry. It sounded very simple and it was the instant version of jelabi recipe making use of yeast. 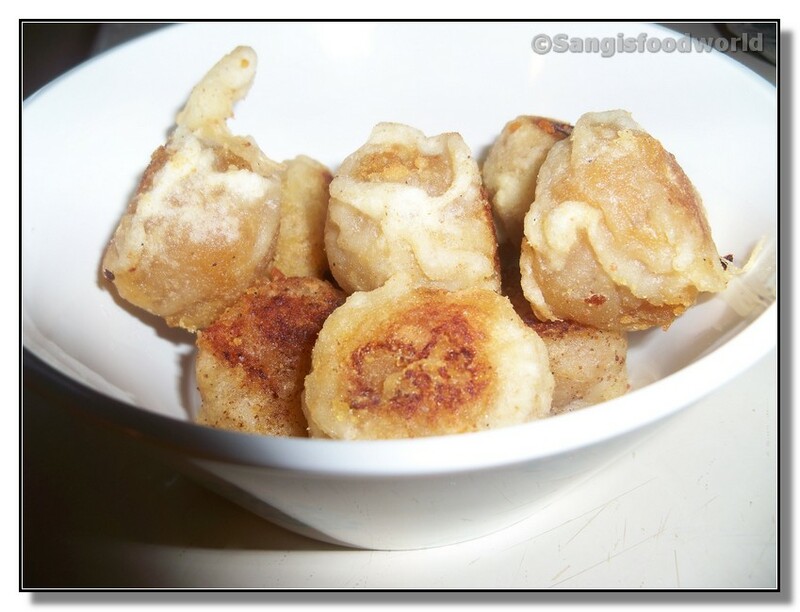 So with no more time to wait I mixed in all the ingredients and squeezed the bubbly batter into the oil to get my yummy jelabis soaked in sweet syrup. 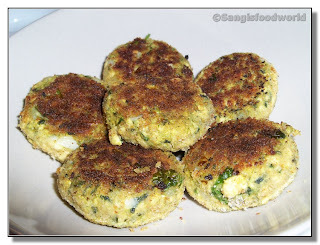 This recipe was great hit and we liked it. I am sure to try this again and next time will try improving on the shape of my jelabis. 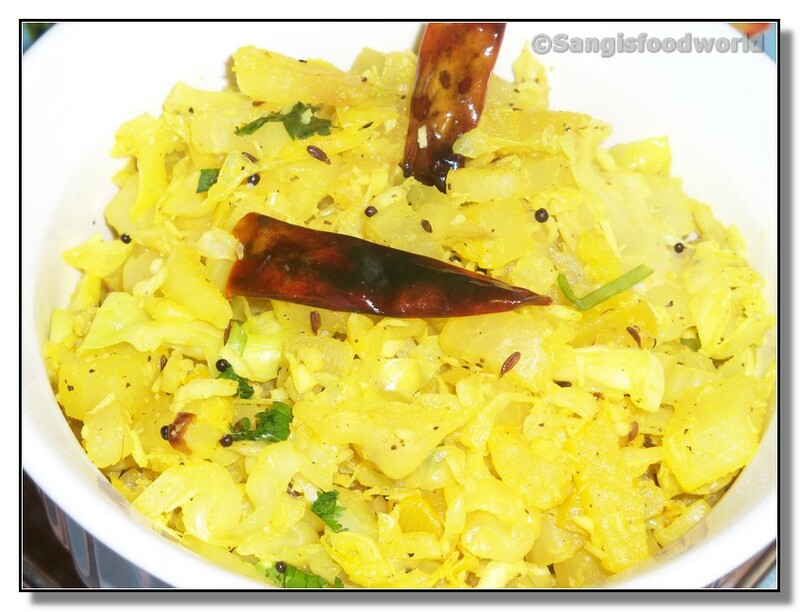 A simple yet delicious curry that will make a great combo with pulav, chapathi, dosa or rice. 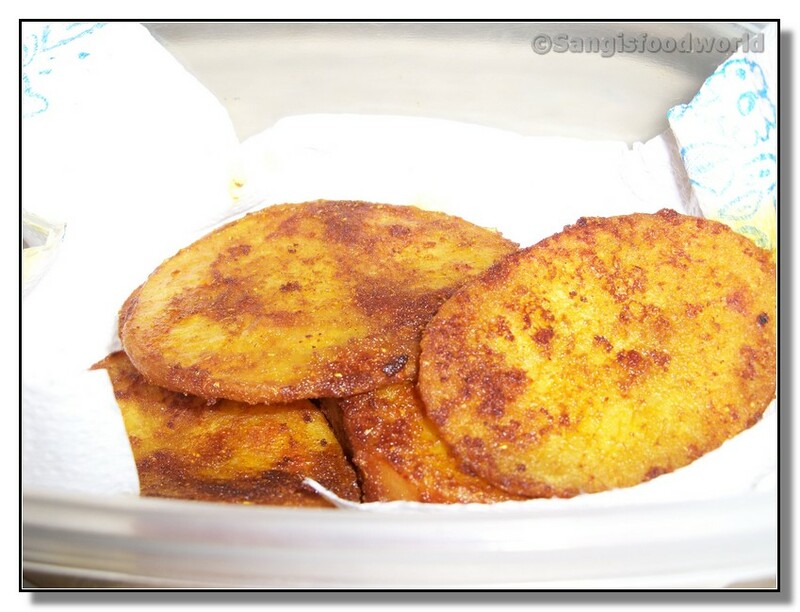 Potatoes and soft pakodas or Bengal gram fritters soaked in the curry filled with flavors of spices and coconut makes it a great dish. 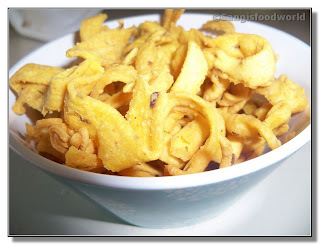 My mom usually makes this kuruma with pakodas by grind the kadalai paruppu. I also made it the same way, but for a simpler version, we can also make the pakodas with just Bengal gram flour/kadalai maavu when we are lazy for elaborated cooking. 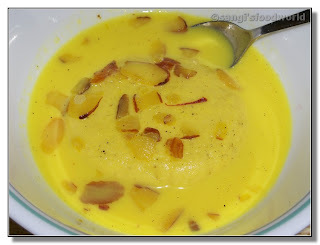 Basundi is one of my favorite sweets which I love to enjoy with chapathi and pooris.. 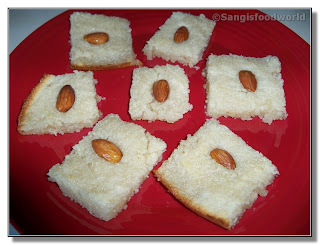 This used to be my favorite combo for my lunchbox during my school days.. How can we forget those days.. :) My mom used to make this yummy, rich, simple dessert often. 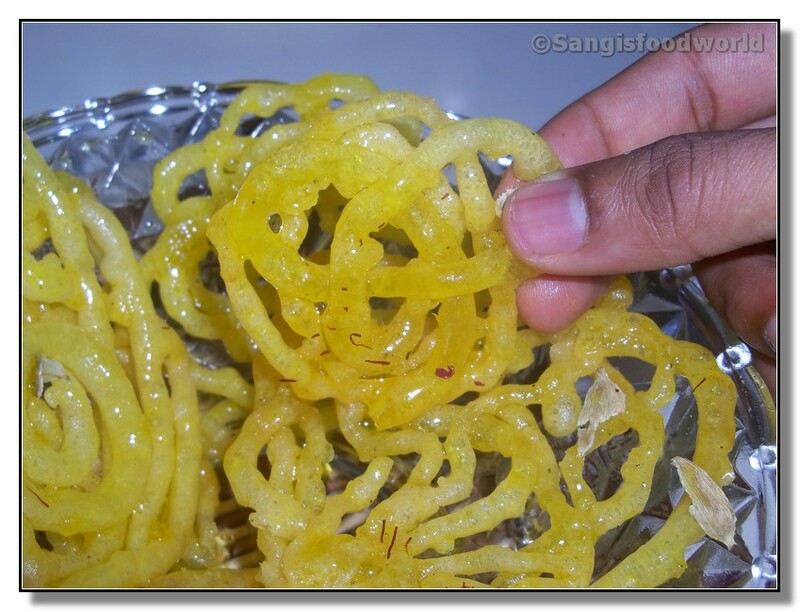 This sweet is simple to make and needs not much of work, that you can fix it up easily for the guests. And there is no way that we could go wrong with this recipe. 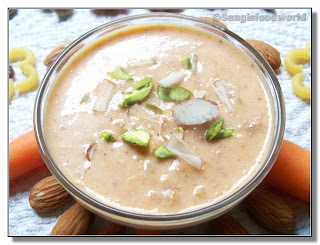 Just for a twist, I tried adding some poppy seeds and almond to the usual basundi and it turned out really rich and delicious. Poppy seed and almonds added more flavors and a rich body to the milk making it a yummy dessert. Happy Saraswathi Pooja/ Ayudha pooja to everyone. Today being the pooja, I was busy making all the food that have to be offered to God as prasadam. 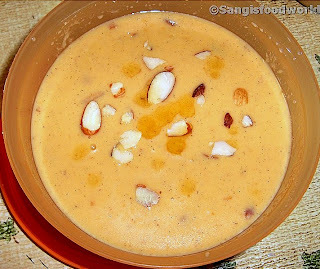 This list includes the Sakkarai ponga, a sweet dish make with rice and jaggery, sundal and vadai. 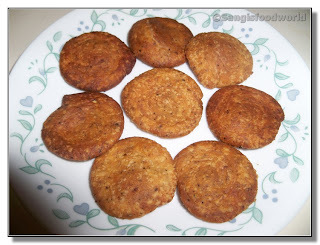 Its a custom in my MIL's place to make only masala vadai for pooja and not the usual Urud dal vadai. I too followed the same tradition. Apart from this prasadams, we also offer rice, paruppu(cooked toor dal), ghee and vegetables of our choice.This pooja is specially referred to as 'Sakthi poojai' in our place and usually performed in the evenings after the sunset. 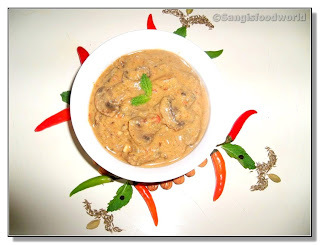 Here comes a spicy, rich delicious curry with mushroom and potatoes loaded with flavors from almonds and mint. 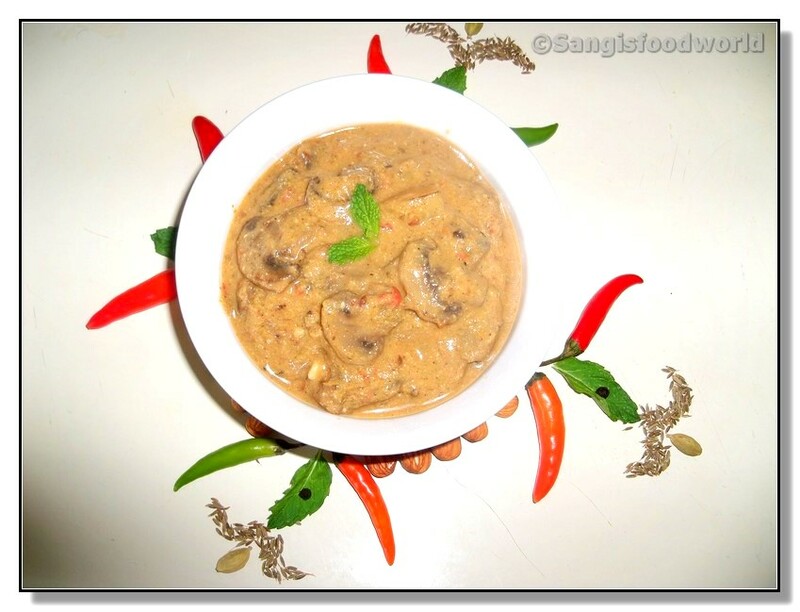 I usually make use of peanuts, almonds, cashews in my gravy to make it rich. But today just for a change, added few mint leaves along with almonds and got this yummy curry filled with minty flavors. It tasted great with rice or chapathi. 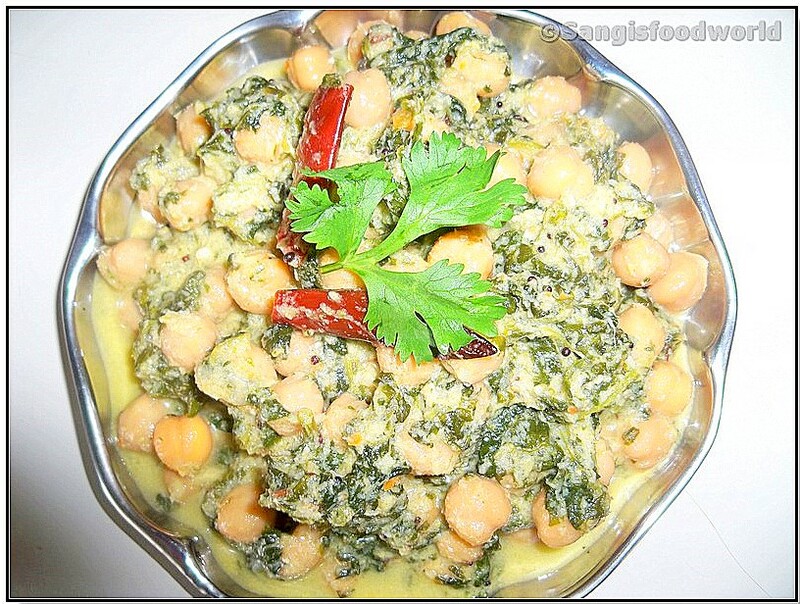 This is a simple and light curry or stew made with chickpeas and spinach. This stew could be made in just few minutes if we have cooked up chickpeas or canned garbanzo beans ready in hand. 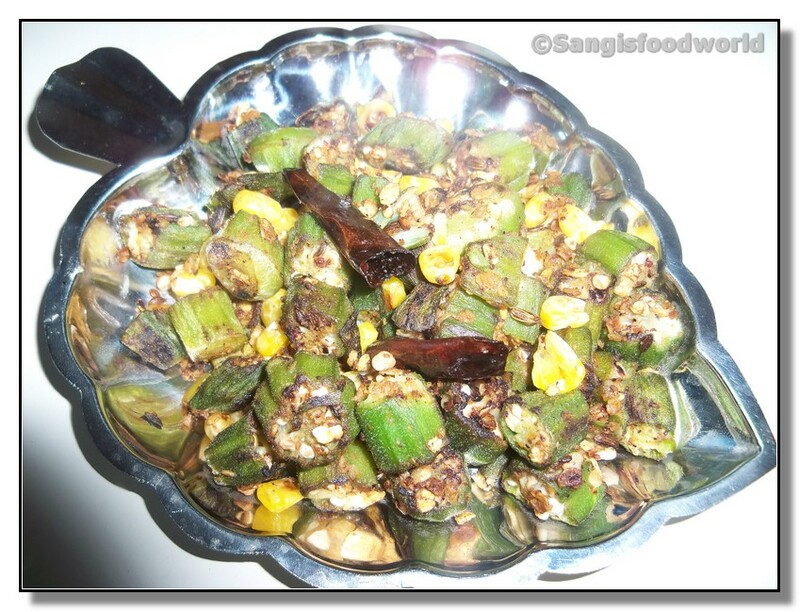 It goes good with idli, dosa, chapathi or as a side for spicy kuzhambu rice. 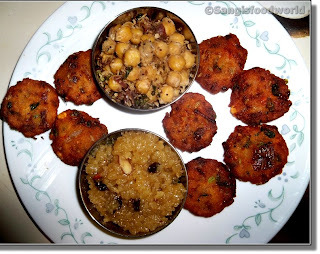 This is my entry to CWF - Chickpeas event by Kiran guest hosted by Nithu. 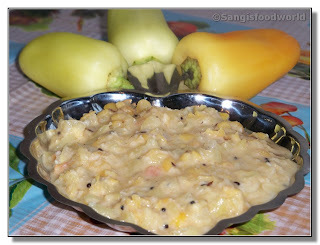 This is a simple chutney that can be made in few minutes to be a good combo with idli or dosa. 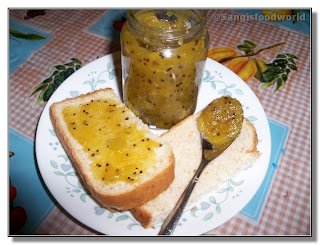 Few people make this chutney just with tomatoes. But I have also added some onions to give in extra flavors. 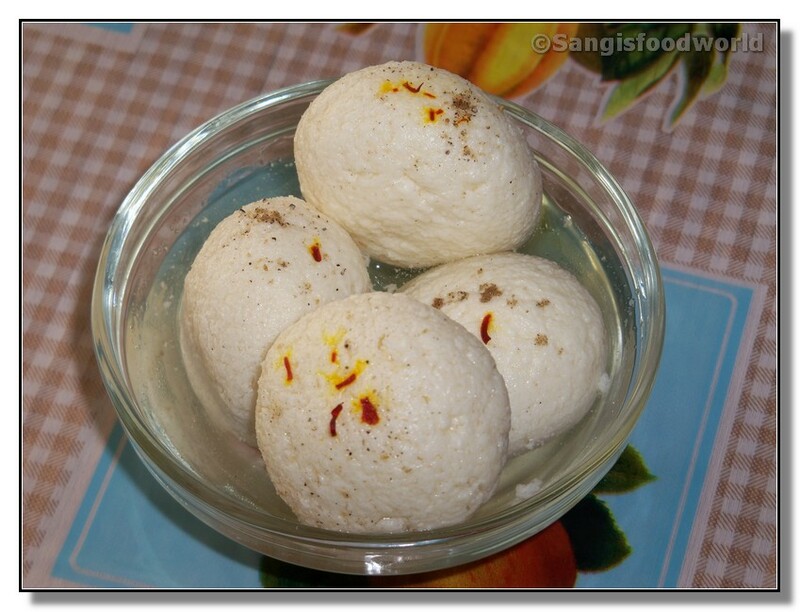 Here comes another simple laddu recipe I tried for Celebrate sweets- Laddu event started by Nivedita and guest hosted by Nithu. 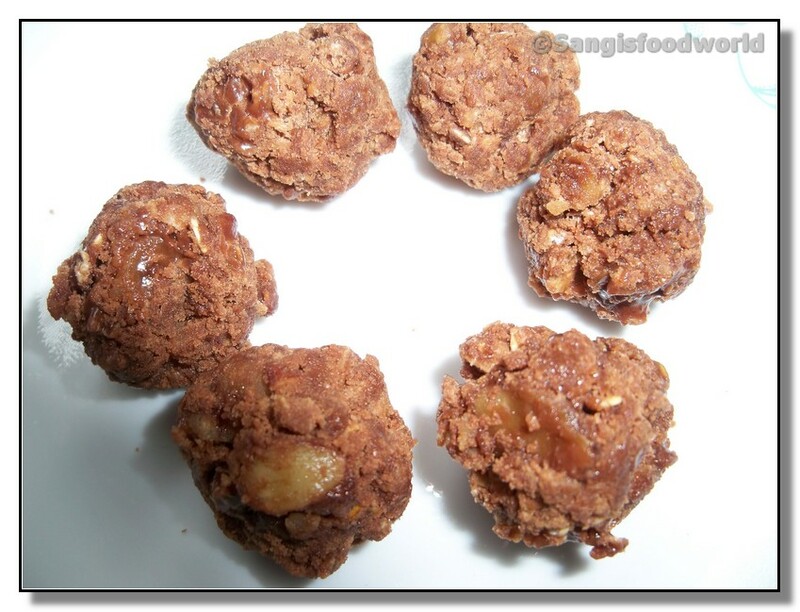 This is a simple and chocolaty laddu made with oats and filled with nutty flavors of walnuts. Chocolate in any form is always good. Same goes with this laddu too.. It was really yummy and rich with chocolate that we could hardly taste the oats in it. 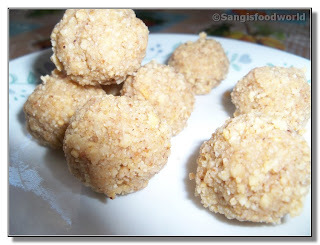 Here comes a yummy and new kind of laddu that I tried yesterday. 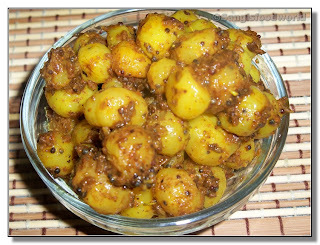 I was having some leftover khoya I used for gulab jamuns sitting in my fridge. To finish it off, I was thinking of making some sweet. Then came the idea of this laddu. 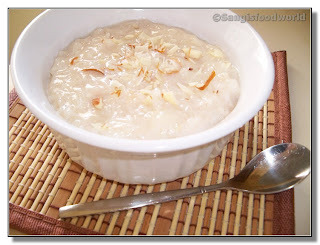 Just oats wouldn't give much flavor to the sweet, so decided to add almonds too. This combo of almonds, khoya and oats resulted in a really delicious laddu. This is the dish I made for Nayna's Flavors of Gujarat event. I got this yummy snack recipe from Kajal's Recipes. Her beautiful presentation and the tempting pics made me try this recipe. My farsi puris turned out really great. These are mini, crispy, spicy puris filled with flavors from cumin and ajwani seeds. I usually make briyani in pressure cooker and follow my mom's recipe. 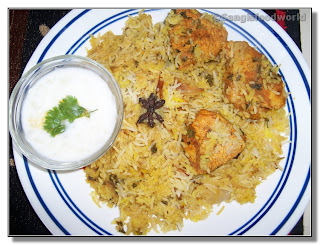 My hubby also likes my briyani recipe and we make briyani once in a month usually on Sunday. But this time he wanted me to make the Hyderabadi style of briyani. So I made the Hyderabadi chicken briyani for our Sunday lunch. I have made this briyani many times and few times it has turned out perfect. That's because it sometimes made mistakes by overcooking rice. So this time I didn't want to repeat the same flaws and to my surprise.. 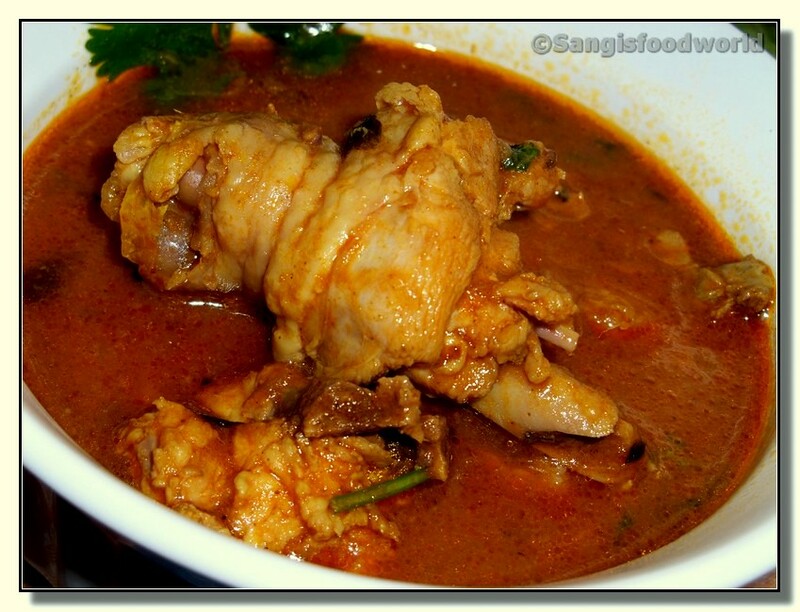 It was a happy plate of steaming hot Hyderabadi briyani which we enjoyed with spicy prawn curry. Thinking what to make for breakfast or evening snack.. 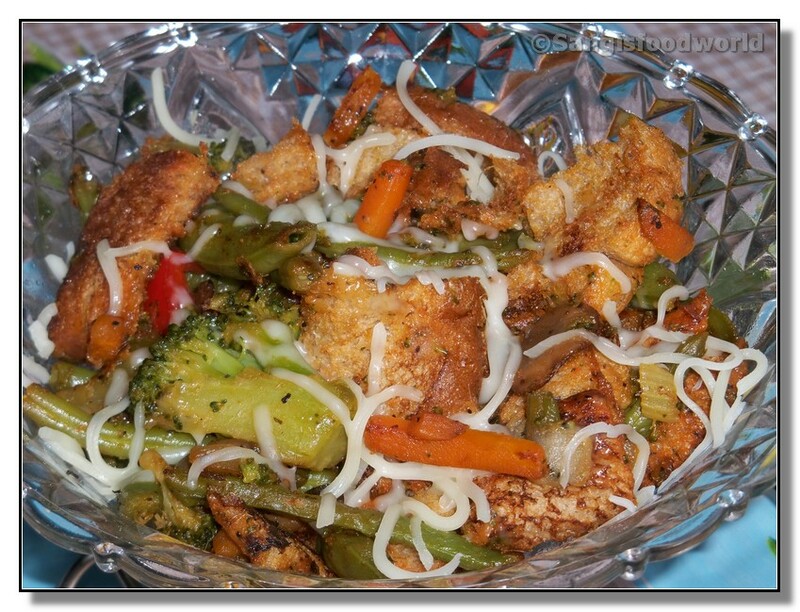 Here is a simple and healthy dish using bread and mixed vegetables. 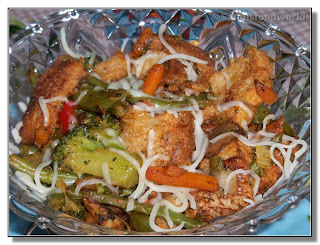 Just with a pack of mixed veggies and few bread slice, our plate will be filled with colorful and delicious dish. We bought lot of fruits last weekend, as we went to the near by farmers market. We got some kiwis and pineapples too. But unfortunately the pineapple was not sweet enough. So I just combined the kiwis and pineapple to make a preserve. 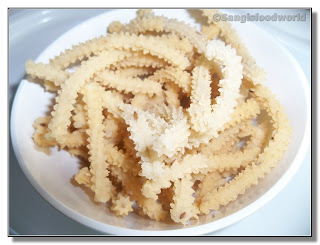 The preserve was really great and we enjoy it with bread or chapathi. Just with simple ingredients we could make delicious preserve at our home with the fresh fruits. 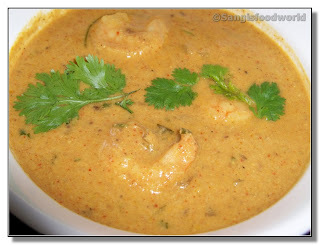 Here is a spicy prawn curry which is an intermediate between kuzhambhu and kuruma recipe. This recipe uses less coconut but still is a rich gravy with almonds added to it. 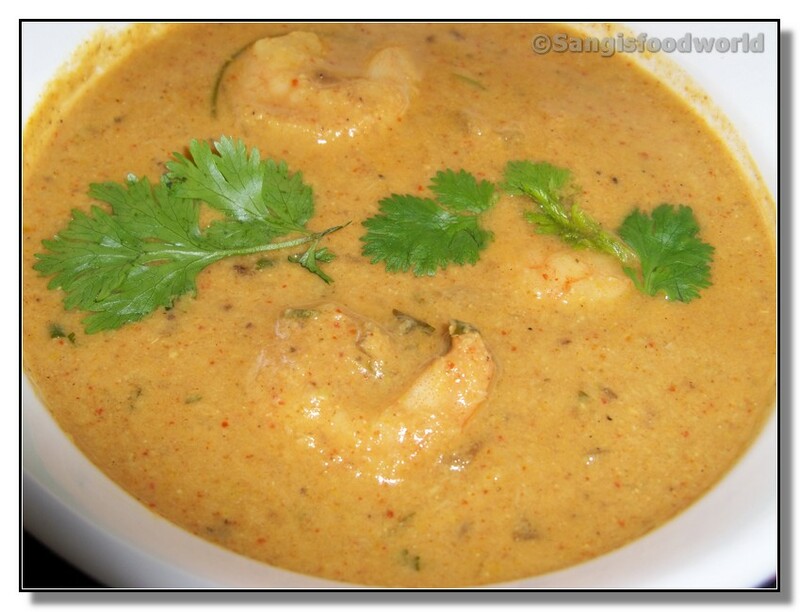 This gravy will taste great with briyani, pulav, rice or chapathi. Same recipe can be used for chicken, mutton or even potato curry. Yesterday being my hubby's birthday, I made some of his favorite foods including mutton briyani, chicken kuruma, fish fry, gulab jamuns and also baked his birthday cake myself... :D I made him a black forest cake and it turned out to be great and he liked it a lot. My hubby loves gulab jamuns, but not the ones made using mix. He likes only if I make them from scratch. So I having being trying harder for past few weeks to perfect my gulab jamun recipe and at last it was a great hit with him. After my three bad failures I got this perfect and easy gulab jamun recipe. 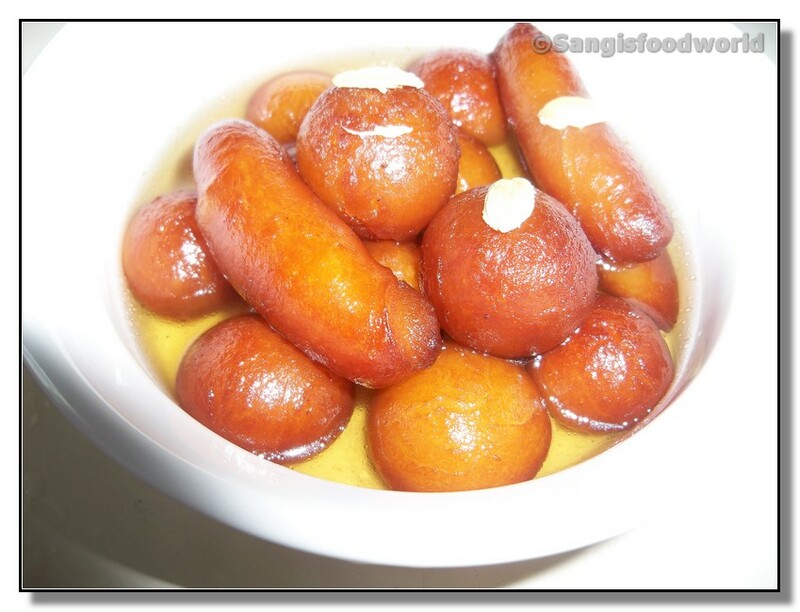 If you have khoya at hand, yummy, soft gulab jamuns will be ready in few minutes. I have been thinking about making my own chocolate cake for a long time. 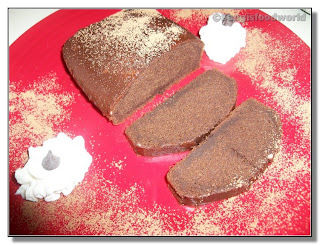 When I was searching for a simple and decent chocolate cake recipe, I was attracted towards a pic of a chocolate cake slice, which looked really moist, soft and delicious. I immediately wanted to try it and to my surprise it was a steamed cake!! I got much more interested and made this cake. The cake was really moist, yummy and was too simple to make. I we just have a pressure cooker and want to make a rich yummy chocolate cake, then this recipe is sure to help. Its a dense rich chocolaty cake which was enjoyed by us with coffee. Mava Cake - Tried and Tasted from My Diverse Kitchen.. 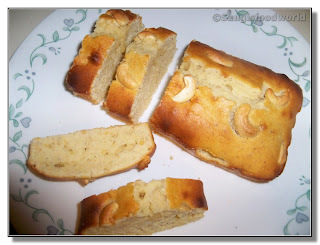 While I was browsing through Aparna's My Diverse kitchen, this cake recipe caught my eyes. It was quiet a simple cake recipe, incorporating unique Indian flavors into it. I am a person who loves cashews and flavors of cardamon in anything. So I wanted to try this cake and it turned out to be really great. Mava cake turned out to be really delicious, soft, filled with flavors of cardamon and khoya. My hubby liked this cake and enjoys it with his coffee. But next time he wanted me to add more cashews into the cake. This is a simple fried rice recipe with slight twist from the usual egg fried rice. 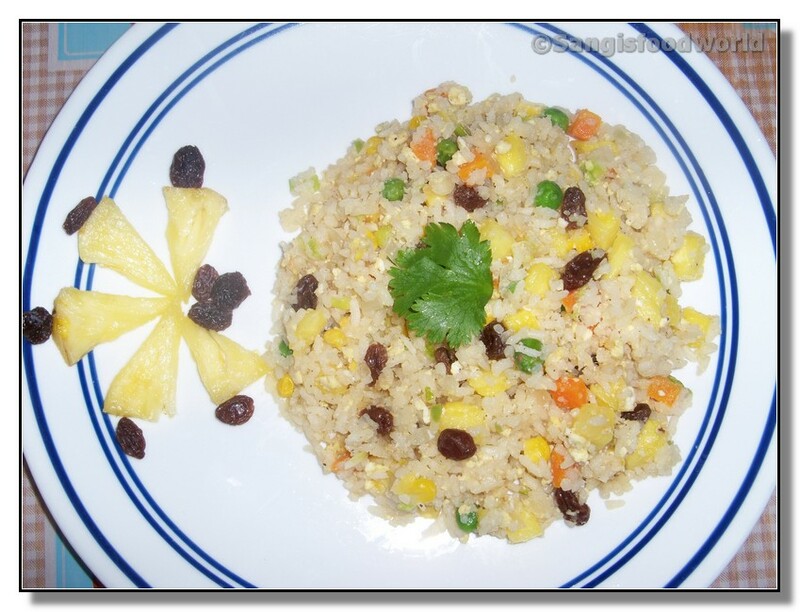 I got this idea from the Thai pineapple rice and modified the recipe to suite our taste. Add pineapples and raisins to the rice really enhanced the flavors, also the mild sweetness from pineapples and chewy raisins in each bite made the fried rice great. Basboosa is a traditional Egyptian semolina cake, made with few ingredients but tastes great. 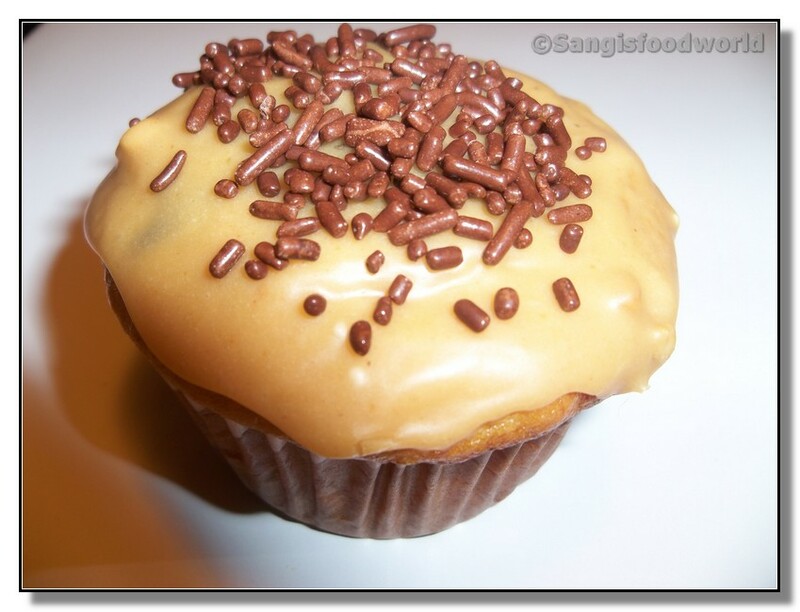 Its a soft, moist cake that soaked in honey sugar syrup. 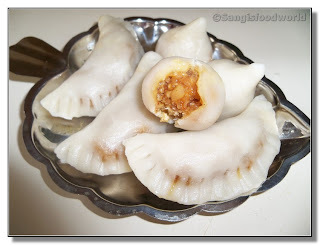 Its very simple to make and tastes good with tea. My recipe made quiet sweeter cakes. So next time I will reduce the sugar used for syrup a little bit. Here is my Rasmalai and Rasgulla for Jay's Letz relishh event- Paneer. 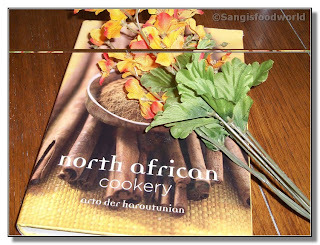 I will soon start trying out the recipes from this book and share with you all. This year I started my Krishna Jayanthi preparations with this peda. 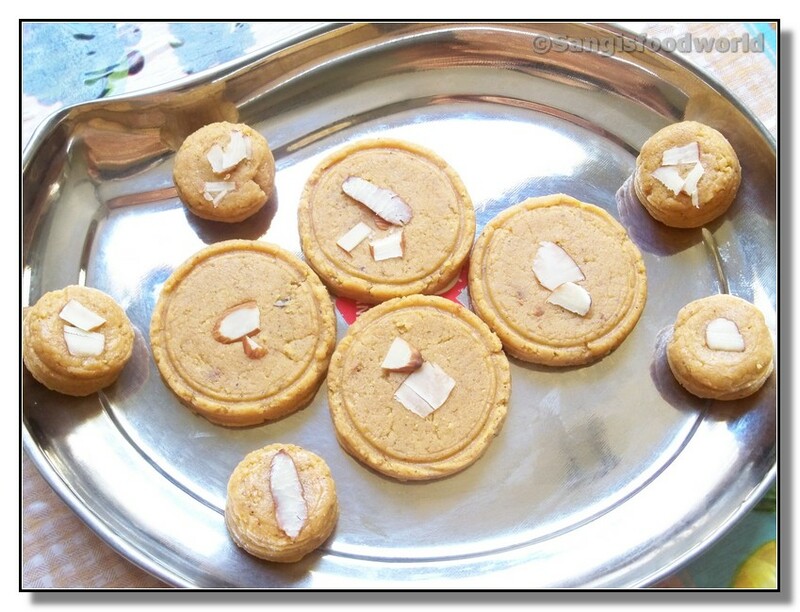 Its usual tradition to make milk sweets as part of offerings to Lord Krishna. So decided to make some pedas. Just add few butterscotch chips that was laying in my pantry to give some new flavor to the sweet. Peda is one of the easiest dessert to make. 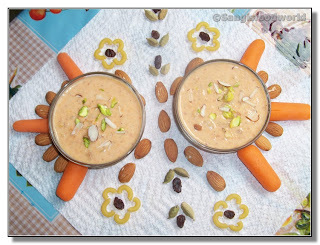 Mixing together milk, sugar, nuts and the extra flavors we need in right proportion will result in yummy pedas. Every cuisine seems to have their version of rice pudding. One such Turkish version is the Sutlac, which is a light, creamy and easier pudding to make. This Turkish pudding has two versions, one is the normal stove top version called Sutlac and other is baked pudding called Firin Sutlac. I have made the stove top version and it was really yummy. 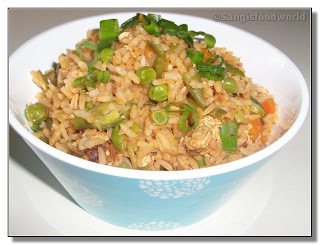 I had some left over rice cooked for yesterday's dinner. Didn't want to waste it and also I was not in a mood for long cooking hours. So thought of adding few veggies and some flavor to the left over rice and made it into a delicious colorful variety rice for our lunch. 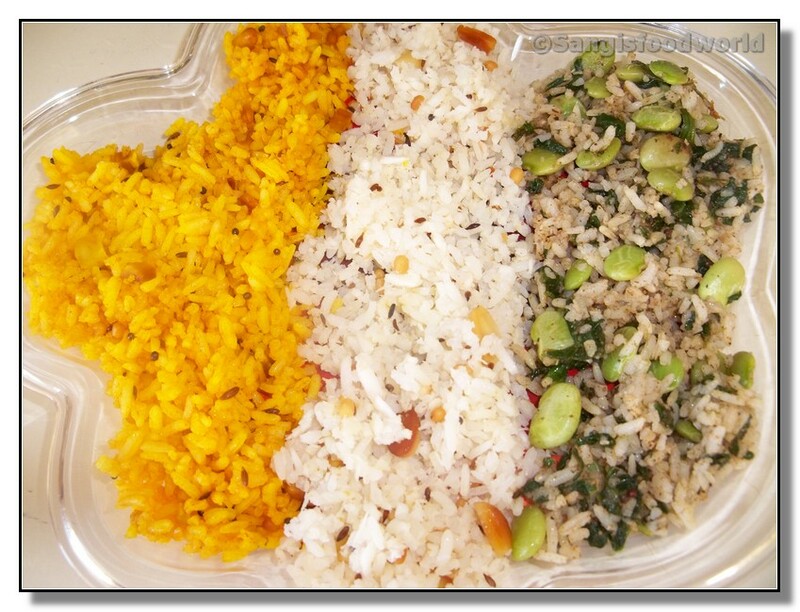 A plate of colorful variety rice will always be perfect with some raita, chips or appalam. I didn't want to make the usual lemon rice or puliyodharae. 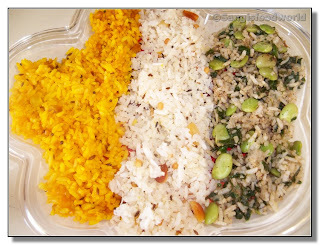 So just modified the usual stuff to add extra flavors and so came our lunch plate with Carrot lemon rice, spinach Lima bean rice, coconut rice. It was a perfect combo of tangy-spicy-rich rice dishes. 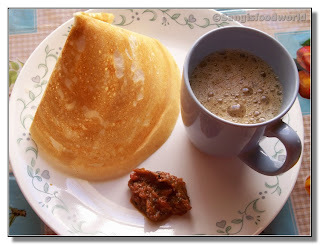 Are you in mood for a different dosa.. Thinking what to make for dinner without dosa batter.. Then here comes the easy yummy dosa that can be made in a jiffy. 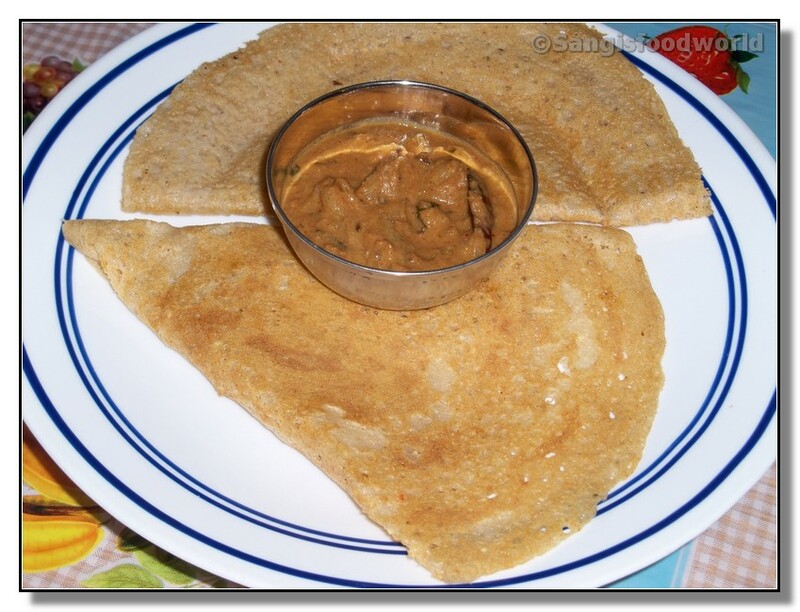 When ever I am out of my usual dosa/idli batter, I keep experimenting by combining all the dals to make a new dosa/adai. 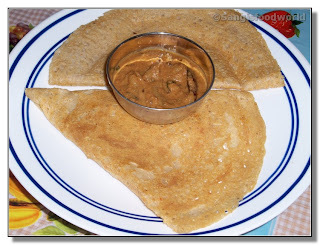 In that process, came my cucumber mint dosa which tasted really good and is a great fix for breakfast and dinner when we are short of regular dosa batter. It has been very long since we had pooris. I guess we had it sometime back in India.. :D My hubby usually don't like fried stuff and so I avoid making deep fried stuff. 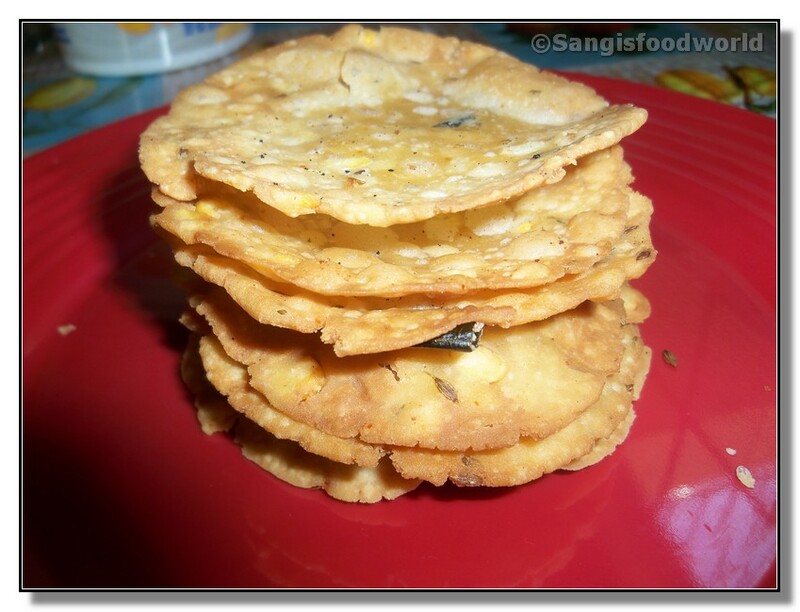 But today there was something that was making me of pooris.. I don't know why.. 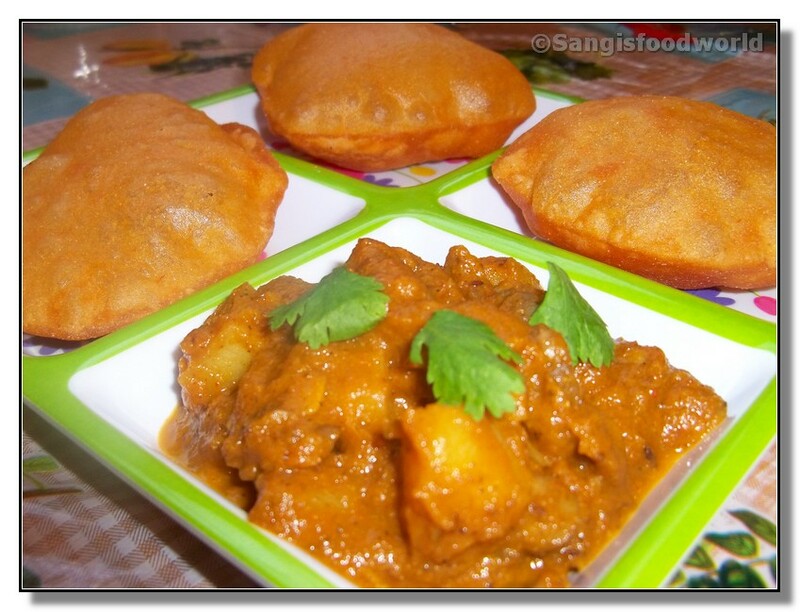 So I decided to make poori and mushroom curry for our dinner. Just thought of adding some tomato paste, few spices and ginger garlic paste and made a spicy tomato poori. 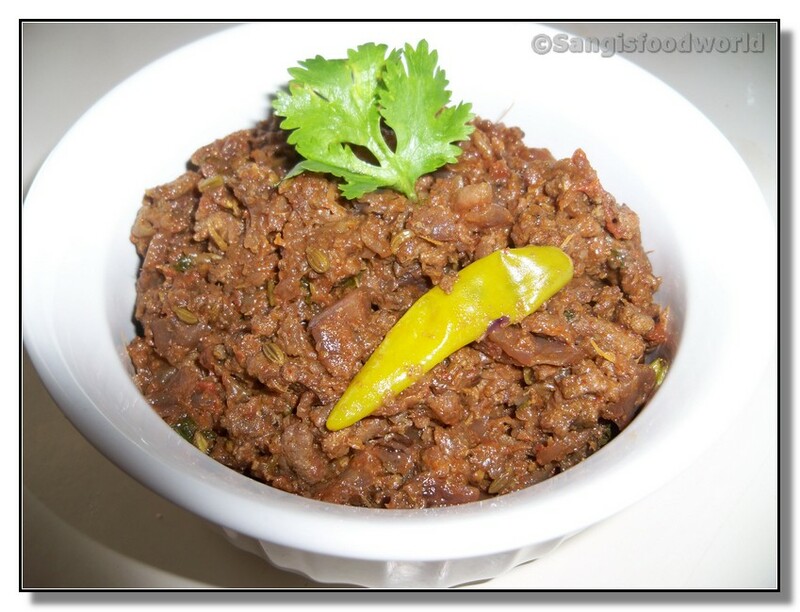 I usually make the kheema curry whenever we buy turkey. 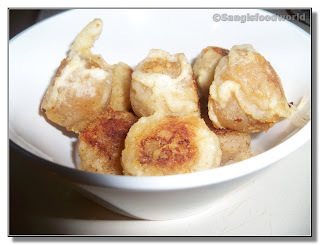 But this time I tried some turkey pakodas and had some left over turkey meat in the freezer. This was not sufficient enough for our lunch. So I decided to add some filler to the meat and make it up for our lunch pate.. ;) So came the turkey cabbage kheema curry. Here I have used purple cabbage, but the recipe can be adapted with normal cabbage too. Thinking for simple side dish to go with sambar rice, kuzhambu sadam or even curd rice... Here comes the simple and delicious cabbage radish poriyal. I was just left out with some chopped cabbage and radish in my fridge. 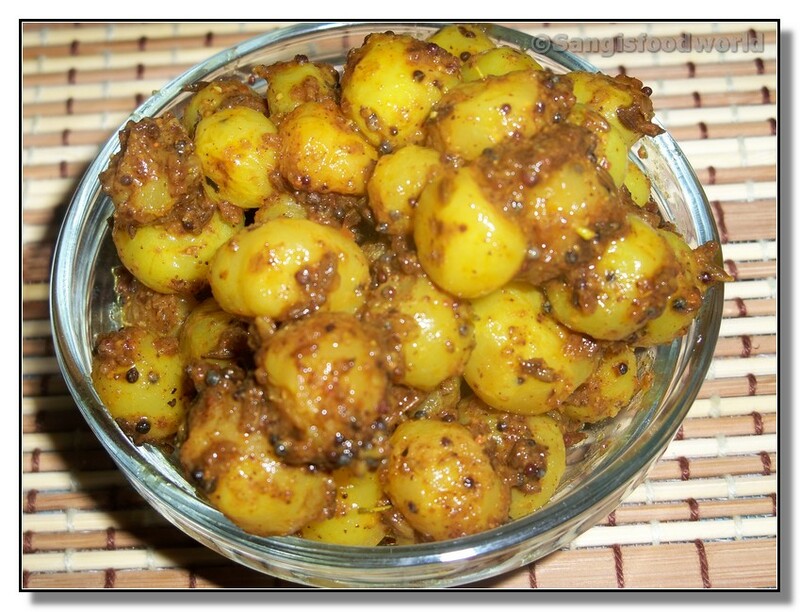 So I just grabbed them both and made a simple poriyal to go with the sambar rice. I have read about the Chinese and Japanese steamed cakes. 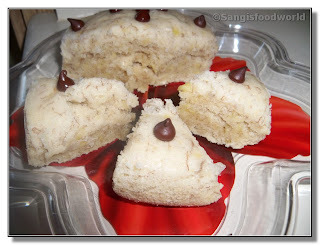 In a curiosity to taste them, I tried this steamed banana cake with the ripen banana I had in my fridge. I followed this original recipe and the cake turned out to be really soft and light. I would call it a healthy cake making used of very less fat and also less sugar. But next time when I make this cake, I am sure to increase the sugar and also add some flavoring extracts like vanilla or almond . 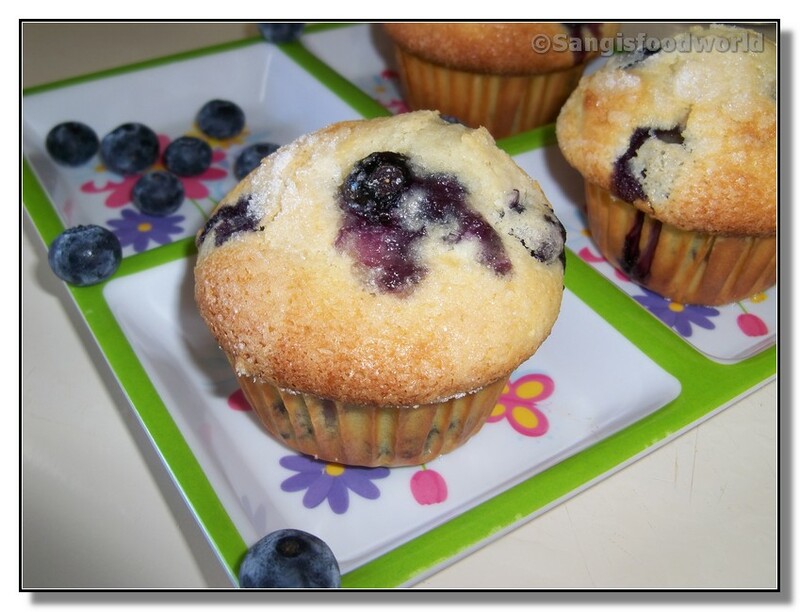 We can also try adding some chocolate chips, nuts or raisins to make the cake taste rich.